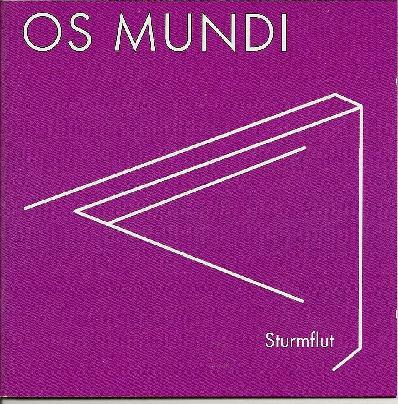 As for those of you who aren't familiar with Os Mundi, they were an early '70's progressive band from Berlin, Germany. Personally, I liked their two other CD's a bit better - ' Latin Mass' (' 70) and '43 Minuten' (' 72). This 2008 release of 'Sturmflut' (in English, that means Storm Tide) is a collection of the band's unreleased work, recorded between 1973 - 75. Best described - possibly as low-key progressive. On a five star scale, I would likely give it three-and-a-half stars. Tracks that I was digging the most were the rather lively nine-minute "Don't Ask" (good bass lines), the well played "Deef Bass" and the somewhat dream-like "Wabar Wabar". The second half of this release turns jazzy - but I didn't really mind so much. I mean the title cut "Sturmflut", "En Suite" and "Riding On The Road" at least provides strong evidence that Os Mundi can, in fact be musically diverse. Line-up: Udo Arndt - guitar & synthesizer, Mikro Rilling - cello, Dietrich Markgraf - flute, Klaus Henrichs - alto sax & baritone sax, Ludolf Kuchenbuch - tenor sax & soprano sax, Harald Skorepa - piano & synthesizer, Christoph Busse - drums and Michael Gunter (Agitation Free) - guest on bass. Comes with a 32-page informative CD booklet. Basically, if you like other similar titles as such on the Garden Of Delights label, you'll probably enjoy this title.